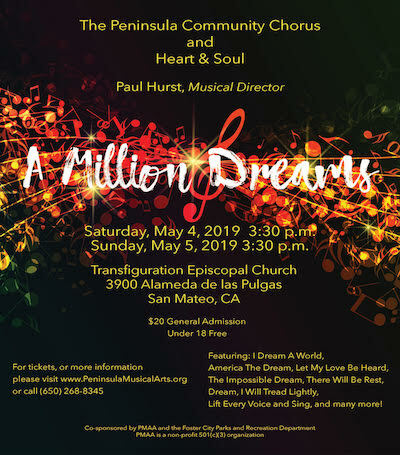 Inspiration, Aspiration, and Hope Through Song featured at the Peninsula Community Chorus, "A Million Dreams" concerts on Saturday, May 4 and Sunday, May 5 at 3:30pm. This afternoon of eclectic choral music offers messages of dream and visions of a world filled with peace and love, with respect for all living things, the environment, and our one human family. The words move us, the music uplifts us and fills our hearts with hope and determination to create a better world and a better future. Concerts will be at Transfiguration Episcopal Church. We hope to see you then! General admission tickets age 18 and older are $20, those under 18 are free. To reserve a place for our Spring 2019 concerts, purchase your ticket in advance from singers, or at Eventbrite website. Tickets can also be purchased at the door. Cash, credit cards, and checks are accepted. See our events on Facebook. Groups of 10 or more receive a discounted price of only $18 a ticket. Please call 650.268.8345 to arrange for a group discount.